I've never shared a photo of my kitchen. I always crop it out of my photos, because I think it needs a lot of work. I'm lucky enough to have a new kitchen, but our finishes are contractor grade. We just ordered new Corian countertops, so I'm ready to start sharing photos because we're finally going to start updating the kitchen! I've marked all the stuff I think needs work. Some of it is just stuff I need to organize, but most of it is stuff we can't afford to change right now. tile countertops: We're getting new ones in a few weeks, so I can finally check that off my list. Right now they're cheap white tile countertops. Though I think the tile countertops look pretty good in photos since you can't see the dirty grout or the uneven tiles. no backsplash: We're also working on this soon, probably as soon as the countertops are done. We figure it's pretty inexpensive if we do it ourselves. I've been told it's pretty easy to do, but we'll see. ugly knobs: This is another thing that will get done really soon. These knobs aren't horrible, but my finger keeps getting stuck when I try and pull open the cabinets and so I hate them now. Plus I prefer stainless steel knobs. cheap dishwasher: It's broken and ugly. We're getting a new one soon. ugly arches: I really hate the ugly arches on the top cabinets. I really want flat cabinets with no details, but I would have been satisfied if the top cabinets looked like the bottom ones. Simona, thinks I'm crazy and says the arches are fine, but I still can't stand them. I have no idea if I'll ever change them since the cabinets are pretty new, but we'll see. Maybe I can find the same color and brand on craigslist or something. boring fixtures: I hate them. I want new ones. boring tan floors: I really hate tan, I want a more interesting floor someday. Maybe cork or something like that, but for now they're in decent condition so I'll have to deal with it. white oven & microwave: We want to change all our appliances to stainless steel, but that's going to have to be a future change. mess: I have no idea why we decided to store things above the fridge, but all that stuff needs to go. I didn't even realize how much had piled up until I took this picture. 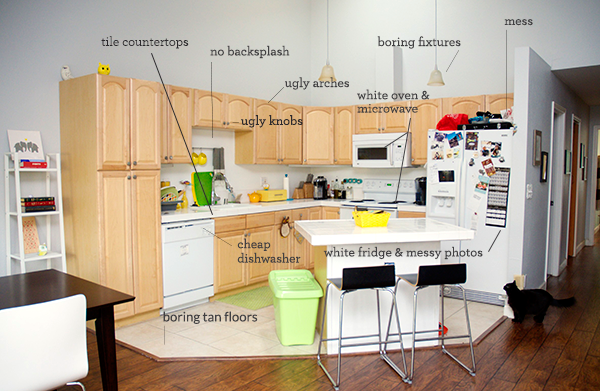 white fridge & messy photos: We eventually want a stainless steel, french door fridge. Also, I need to organize the photos on my fridge. Have you considered extending the wood flooring through the kitchen? Perhaps that's not an option but it would make the kitchen seem larger. That is a GREAT idea! I'm going to see if we have enough of the flooring right now!